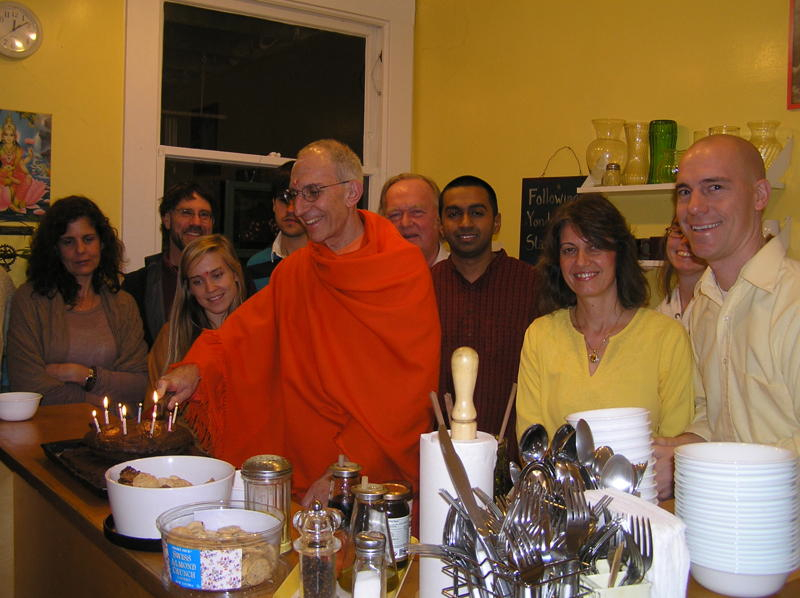 More than 20 yoga enthusiasts gathered last night for meditation, chanting, worship, readings, and birthday celebration of founder Swami Vishnudevananda. The satsang (literal meaning: company of the wise, association with the Truth, or put simply, a meeting of spiritually-minded individuals) ended with 1/2 hour chanting of the mantra Om Namo Narayanaya for world harmony and peace till 12am. Resolve forms were handed out with explanation how to use them to prepare for 2011. To conclude this lively occasion we all met in the kitchen to finish the evening with delicious soup, bread, and birthday cake. Everyone left inspired and uplifted. This entry was posted in Uncategorized and tagged birthday, chanting, kirtan, meditation, satsang, yoga. Bookmark the permalink.